STEP 4 :- To login use admission number of your ward both as User Id and Password. STEP 5 :- Enter your current password (ward’s admission. no. ), New password and Confirm password then click on SAVE button. Immediately change your password. Remember your User ID and Password. STEP 6 :- Again Login with your User Id (ward’s admission no.) and New password. STEP 7 :- Click on PAY FEE link on next page. STEP 8 :- Select the month Jan or any number of months you want to pay and click on GET FEE. Students Detail and fee details will be displayed. 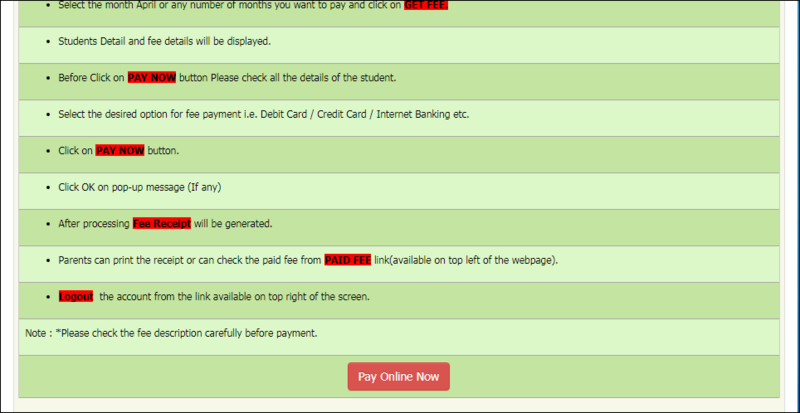 STEP 10 :- Select the desired option for fee payment i.e. Debit Card / Credit Card / Internet Banking etc.